Nobody remembers when or how I joined the newspaper’s proofreading department, except for me, of course. It was in the spring. To fill the opening, they held a little writing test, to which ten of us showed up. My great stroke of luck was that none of the other nine knew how to spell the word desahuciado correctly. They all put the “h” between the “s” and the “a.” In the early nineties, that word was rare in Spanish-language newspaper pages. I assume that now, as evictions have become so much more common, they all would have spelled it right. That was how I made my triumphant entrance into La Gaceta Balear, one of the widest-read newspapers in Palma, where I would work six days a week, from seven in the evening until one in the morning. They sat me at a table with two pretty large trays, one on each side of the computer: the texts to correct were piled up in the left-hand one—they always printed a paper copy of each article—and the right-hand one was where I would leave them after correction. I can say that the little I know about computers I learned there, on the fly. I’ve always liked words to be well written. First words, then sentences. Everything in order, without any mistakes. Some people can’t stand seeing dust on top of furniture or people touching their car. I don’t like seeing words mistreated. You know those people who say that accent marks aren’t important or who don’t use commas or periods and don’t let you breathe until the end of their interminable sentences? I can’t stomach them. Each hour was different from the next. Some moments of the day were quite calm. But between eight and nine, the reporters started to get nervous, and the pace of work multiplied tenfold. Sundays, especially, were horrifying. Most of the texts that needed correcting were regional soccer rosters and game recaps. I didn’t understand anything the journalists wrote. The Sports section was the one that felt the most distant in all senses, despite the fact that the men in Sports yelled the most, and you could hear them from anywhere. The TVs stayed on all night in that buzzing office, where the windows were always kept shut. I spent the entire time watching the clock, hoping it would be time to wrap up. It would be a waste of time to try to explain now how I found myself at that desk, with two drawers in which I kept a good journalist’s style manual and a Real Academia de la Lengua dictionary, as well as a pack of Inca biscuits for quick breaks. I was convinced that, after the summer, I would leave that job and look for another one. I got bored. I got bored a lot. Sometimes, I typed up some things that occurred to me in the midst of that chaos, in a personal file that I’d saved in a folder on the computer. One day, Fani, a young woman in the Legal section, came over to tell me not to change anything in an official text. She was very friendly. She told me that she too had started as a proofreader. “If you’re patient, maybe you’ll become a writer,” she said, as if wanting to encourage me. I smiled at her politely, even though I didn’t see what one thing had to do with the other, and I offered her a biscuit, which she declined, touching her belly. Yes, she was a big girl. And also the only person who had acknowledged me instead of just tossing her sheet of paper into the tray of articles to be corrected from half a meter away without even looking at me. She was the only one who said hello and asked me how I was doing when I arrived at seven each day. The coworker who sat behind me, Cata, only spoke to me when she had to tell me to scoot my chair and desk forward a little more because there was barely any space to move, and she was right up against the wall. The best part about the job was that I knew everything that was happening in the world. The whole world. You could say I’d become a current-events ace. Because for the first time in my life, I read the newspaper from cover to cover almost every day. I couldn’t get distracted at all. I only got up to go to the bathroom. And when the journalists stood in a circle with their coffees or went down to the bar to distract themselves a little and smoke, I had to stay there, trying to reduce the mountain of papers. I gained knowledge of international, national, and local politics. I knew the names of the ministers and the posts they held, and those of the regional and municipal councilors. I knew what happened to the famous people who came to vacation on the island (after spring came summer, after all). I started to have an inkling of what sports were, even soccer, which I’d despised. I recognized team names that I never would have been able to imagine, names of players that didn’t matter to me at all and whose faces I wouldn’t be able to recognize, but I did know which ones scored the most goals. And, finally, I knew about all the concerts, exhibits, book presentations, and everything else that makes up the vast and remarkable cultural world of the city. I could touch culture with my hands. In the end, I even wound up getting interested in sports. But that’s not the story I wanted to tell. What I wanted to say was, even though this was a job I didn’t like—I didn’t like the schedule, the rush, or that no one spoke to me while I typed behind the trays overflowing onto my desk—I had managed to become part of a newspaper, and I was earning a salary. One evening, at a moment when I had my personal file open because there wasn’t any work to do, the director came over to me. He didn’t even know my name. I don’t think we’d ever spoken. On my screen you could read the following phrase: “They didn’t let me correct a flagrant error, because it was for an ad. And whoever’s paying gives the orders. And whoever’s paying can do as they please with spelling. And whoever’s paying is academic. We deeply disagree with whoever’s paying.” What had happened was that the accent marks didn’t look good in the ad, and they’d made me take them out. And so I wrote those words, angrily. But when I saw that the director was coming over, I quickly closed the file. He gestured for me to come into his office, which wasn’t far from my desk. We sat down. He asked me my name, and I responded, forcing a smile and trying not to overdo it. He explained to me that they’d found another proofreader. They wanted to move me to the Agenda page, now that they had some confidence in my work; I would have to do a few days of training. “Right, I know. That’s just one way to put it.” I smiled again. The list of gas stations, the calendar of saints’ days, the weather forecasts, the word search, the “this day in history” blurb, and some cultural events were also printed there each day. But I didn’t get to finish the question. The director had already picked up his phone and I had become invisible to him. I simply wasn’t there. He hadn’t even told me when I could write the current affairs piece and if I would be free to write about whatever I wanted. When it was time for coffee, I mustered the courage to get up and go over to Fani and explain what had happened to me. She already knew. “Today it’s my treat,” I said. “Hey, everyone that’s starting at seven tomorrow: meet for coffee at the bar on the corner by six-thirty. We have a new writer!” And she pointed at me. “It can be a really good section,” one of the local reporters told me. “I don’t write for it now, but I did for a bunch of years. It seems like it’s not that important because it’s part of a throwaway page, but if you think about it, there’s the word search, the weather forecast… people do look at it. They entertain themselves with those little things. That and the obituaries steal the show here; you already know how devoted people are to funerals in our dear city,” he noted as he poured himself a glass from the pitcher. I drank the last sip of my coffee and asked for the check. Fani and Cata came over and congratulated me, even though Cata didn’t seem entirely sincere. I was young then. We mustn’t forget that. It’s essential to keep in mind while reading this story. Over the years, writing articles turns into a job you might even call routine. But you have to start out well and know how to keep going. You can’t ever back down. I had just been given a pair of binoculars with which to observe the world. I had to take the rest out of my toolkit. That was it. Nothing more. The rest of the writers simply thanked me for the coffee and beer. I don’t think they even learned my name or knew why we’d been celebrating. As we went up the stairs to the paper, I heard two girls saying: yeah, she’s the new “Binoculars” writer. And that was it. I also met the new proofreader. He was tall and thin, a recent graduate, and we hit it off right away. It started when he showed me an article by a reporter who wrote about exotic trips. His writing style was just as exotic as his expeditions. “I sit here. I was the proofreader until just the other day. If you need anything, you can just yell out to me,” I said, trying to make him feel better. We went for coffee together every day. I remember my first article perfectly. I devoted the whole thing to writing about a book. It was one of the books that had pushed me to write; in the beginning, we imitate what we discover. But for the story I want to tell here, it doesn’t matter at all what my first article was about. What does matter, however, is the fact that I felt as though I had tried on a new outfit, or a new coat one winter day. One of those rare days when the city wakes up freezing and you search in your closet for the coat that will best cover you. And you put it on and go out to the street feeling very sure of yourself, fearless. It doesn’t matter if the cold leaves your face red and your nose frozen. You keep going, sheltered by your best coat, made from the best-quality wool, firm and resilient. No lapels; buttons up to the chin. Nothing could breach the centimeters of fabric that protected me from the world. That was how I felt when I typed the final period of my twenty-five-line text. I re-read it a few times with pride. With full confidence, I can say that it was not my best “Through the Binoculars” piece. Binoculars need to keep focusing until you can see clearly and the images appear sharp, with perfectly defined contours. I’ve already mentioned that a columnist learns the job on the fly. And that’s how all my afternoons went for a long span of years. I didn’t leave the paper when summer ended. I became an observer who focuses on all the details. In the summer, I would write tips for planning a good vacation, about sunscreen and the danger of prolonged sun exposure, and the loveliest beaches on the island. In the fall, about the expenses of the back-to-school season and the obligatory November cemetery visit. Then, the traditional annual pig slaughters. Christmas enlivened my beloved page, which would offer recommendations to consumers on how to take advantage of the first days of the winter sales. Some years, if I was lucky, it would snow. An homage to the working woman on March 8th was never absent from my page, and neither was a brief commentary about some detail of the Holy Thursday procession, which I put up with stoically, rain or shine. Then came Sant Jordi and the Book Festival. And let’s not forget the first days of summer and beach-going. The year was a wheel that turned and turned. Nothing new happened. The world continued on without moving from the same spot. Except for some mornings when they would tell us we had to stop writing about daily life, because once in a while we were hit with a yellow alert for devastating storms or a red flag for fierce waves. And I was protected by my coat, which suited me perfectly now that I’d started to have some regular readers. Not just Fani or one of the layout artists who, one evening before leaving the office, surprised me by saying the last paragraph of the “Binoculars” he’d just finished reading clearly put forth a biting critique of the cultural minister. My neighbors in the stairwell, my mother’s hairdresser, the shop owner on the corner, and other acquaintances in the neighborhood greeted me differently. I realized that having a column in a newspaper bestowed prestige. Reinés, little by little, started leaving “Through the Binoculars” just for me on my own. The reporters seemed relieved. Not having to write those banal lines, which always felt like a drag, definitely allowed them to finish their work early. Did anyone truly want to explain, again—while also trying to be funny—that they’d gone to the sales and seen two women fighting over bras? Or was it necessary to write that every first of November hundreds of people nostalgically left flowers at the graves of their late family members? No, they were tired of it. They’d rather go after breaking news. My desk was next to Reinés’s office. Every morning there was a long line of people applying to work for him. They all wanted to write for the Gaceta. There’s no shortage of opinions in this world. And putting them down in writing produces a satisfaction that can’t be compared to anything else. I couldn’t figure out what was happening at that newspaper. It was like no one could keep their mouths shut or their hands still. And they all got together to let out what they needed to say. I saw it from where I sat, through my binoculars. I barely had to make an effort. Sometimes you could hear screaming from Reinés’s office. “Do you know who you’re talking to? Do you? !” he once screamed at a wealthy, educated man. But on many occasions, he and his visitor would come out smiling, shake hands at the door, and say goodbye amiably. Some days later, a new column would appear in the main pages, with the visitor’s photograph next to the byline. And one day, out came two guys who seemed pretty important. Sunscreens, cemetery flowers, and book festivals could last you forever. Everything is, like I’ve already said, about consulting your toolkit to avoid tedium. About saying what you like or what you can’t stand. About criticizing. About crying bitterly. About discussing those who move the pawns of every game. I had done it. And even your neighbors in the stairwell, your mother’s hairdresser, and the shopkeeper on the corner had sensed it. But the person who made decisions at the newspaper still hadn’t. In fact, he didn’t even see me at all. Two years had passed and, to him, I was the same trainee he’d assigned one day to that insipid page of pharmacies and gas stations. And due to a series of coincidences, she had at her disposal a little extra corner of the newspaper with twenty-five lines that had to be filled in some way. He called me in one day when I was very proud of my “Binoculars.” I had un-fogged them despite the condensation that was a result of the heat and the newspaper windows always being closed. It was winter, and I had arrived wearing my new coat. Feeling very sure of myself. I’d hung it on the coat rack with care and sat down to type furiously. I went into his office and sat down. He asked me how I felt at the paper. I told him it was going well. “Soon we’ll have the Christmas street decorations, eh?” he smiled. “Yes, that’s true, it’s coming up,” I told him. In fact, I’d already had the Christmas article written for days. He didn’t look at me. His eyes were fixed on his computer, which was much more modern now. He told me that the Agenda page was going to be completely remodeled, and that “Through the Binoculars” already seemed a little outdated. It wasn’t that he wanted to eliminate those little articles I wrote that were so—what was it?—beloved. But now they’d be adding two new collaborators. He wanted to give it a punchier focus, with a touch of political commentary he didn’t envision me writing. “Yeah,” I said again, thinking: wonderful, ten years and I show promise. He made a weird gesture, throwing his head back and opening his eyes wide. How could an idea of his be ridiculous, even if it now seemed outdated to him? Before leaving the office I told him I’d already done the “Binoculars” for the following day. Too bad it wasn’t a farewell. At nine on the dot, I turned off the computer as I did every evening and went to look for my coat on the rack. There were many of them, in different colors, piled on top of each other. Some had even fallen on the floor. I went through all of them, one by one. Mine wasn’t there. I went over to Fani’s desk, a little bit worried. “I don’t think you’re going to find it,” I added. Outside, it was cold and dark, and mist hovered in the air. I walked slowly, dragging my feet. What pained me most was that the work I’d done over so many years hadn’t served any purpose. I thought about my neighbors in the stairwell, my mother’s hairdresser, and the shopkeeper on the corner. How could it be that they’d understood better than anyone? They had understood me. I walked home very slowly, like a ghost dragging something more than its feet. My cheeks felt warm, but my nose was freezing. I felt feverish. And the only things that came to my mind were unconnected phrases. Who will take over my binoculars? Where will all the things I’ve said wind up? Will anyone remember the flowers I brought to the cemetery this first of November? Or the jokes I wrote about the January sales, in an attempt to be funny? And who will notice that I don’t go to the beaches in the winter anymore, just to prove that they exist and to say that they’re much nicer than in the summer, even though no one actually goes to see them? “A light little thing,” Reinés had said. All of a sudden, I began to tremble. I couldn’t control the chills without the coat that had protected me before. As if I were naked. My whole body hurt. Head, neck, back. I didn’t even have pockets to warm up my hands. That’s it. This was the story I wanted to tell. Now I’m at home, sitting in front of the computer, and I’m writing an article. The one for this week won’t be about economics, or politics, or society. Nor do I want to write about books, or about language. I want it to be a banal article, for lots of laughs. About a time long ago when I had a desk among many desks and I worked this job, but as if I were doing it as a joke. And about when I had to listen to men who screamed: “How dare you? Do you know who you’re talking to? !” and in that way got things they considered to be important. The shopkeeper retired and my mother’s hairdresser sold the business, but my neighbors in the stairwell, who continue to read me, told me a few days ago that, since I changed newspapers, “Through the Binoculars” isn’t worth reading. For me, it’s been a while since it vanished into the mist of the night. “The Overcoat, by Nikolai Gogol” appears in Neus Canyelles’s 2014 short story collection Mai no sé què fer fora de casa [I Never Know What to Do Outside the House], which won the prestigious Mercè Rodoreda Prize for short stories written in Catalan. Mai no sé què fer fora de casa is especially intriguing from the point of view of translation. In the collection, Canyelles presents adaptations of 16 short stories by well-known international writers, including Dorothy Parker, Raymond Carver, Isak Dinesen, and Vladimir Nabokov. The title of each story is the Catalan translation of the original title, with the author’s name included. The stories do not directly copy or translate, but rather transform the originals by bringing them into a semi-autobiographical first-person narrative of one central protagonist, a woman who works as a journalist in Palma. The stories are all interconnected, but the episodes do not appear in chronological order. A major theme of the collection as a whole—as signaled in the title—is that of the everyday. The presence of the quotidian and domestic asks us to reconsider what makes a worthy literary subject, as well as the gender implications involved. Per its diverse intertexts, the collection contains an array of styles, and its tone is by turns playful, critical, nostalgic, and ironic. The collection, through its narrator-as-translator, seems to trace a borderline between what is ripe for translation and what is not, while simultaneously calling that border into question. I, too, have often found myself negotiating this line and engaging not only with Canyelles’s stories, but also with the stories they reference. To that end, I am grateful to Richard Pevear and Larissa Volokhonsky’s English translation of the original Russian “The Overcoat,” which was an invaluable intertext in this process.“The Overcoat, by Nikolai Gogol,” adds new metaphorical valences to Gogol’s titular image as it depicts a woman who begins working at a newspaper, first as a proofreader, and later, as a writer. The story incisively transposes Gogol’s critique of bureaucracy into a subtle critique of gender and power in the workplace, particularly in the field of journalism. If Gogol’s overcoat haunts, then we might say that Canyelles’s story haunts back. Marlena Gittleman is a translator from Catalan and Spanish based in the Bay Area. She is currently earning a Ph.D. in Comparative Literature with a Designated Emphasis in Women, Gender, and Sexuality at the University of California, Berkeley. Some of Marlena’s translations have appeared in Asymptote and eL Paper. 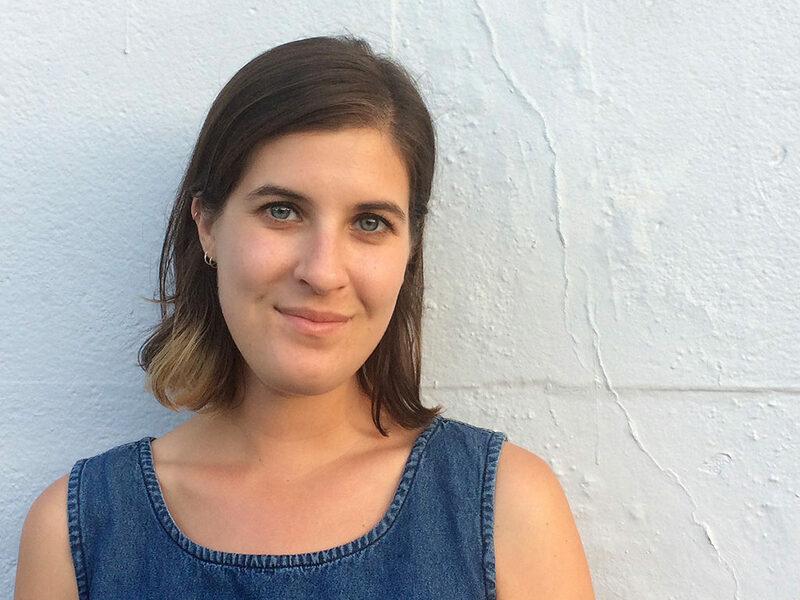 She has just completed a yearlong Emerging Translator Mentorship Program in Catalan through the American Literary Translators Association (ALTA). Neus Canyelles is a Majorcan journalist with degrees in Spanish Philology and Piano who writes for Última Hora, a daily newspaper in Palma. She is the author of five award-winning books, most recently La novel·la de Dickens. Her last published book, the collection of short stories Mai no sé què fer fora de casa, won her the prestigious Mercè Rodoreda Prize. Her new novel, Les millors vacances de la meva vida, has just been published.